Ace Director Raman Kumar, in association with Producer DS Pahwa, is back with an emotional rollercoaster of a play. 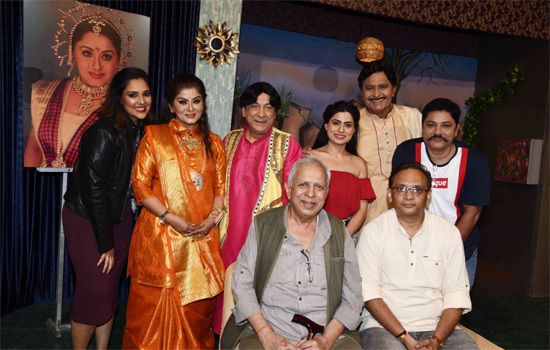 KuchhMeetha Ho Jaye stars SudhaChandran and RidhimaRakeshBedi as the mother-daughter duo along with Paintal, Avtar Gill, Ravi Gossain, PoojaaRaajput and HarshitaShukla. The cast and crew of KuchhMeetha Ho Jaye were spotted at the do during their first show at Rang Sharda Auditorium, Bandra. Avtar Gill played Dinesh Kumar alias DK, who is a friend to SudhaChandran’s on-screen character, Sagarika. Paintal played the role of a loyalist who accompanies Sagarika as a Tabla player whereas Ravi Gossain played Reema’s (RidhimaRakeshBedi) husband. Ridhima portrayed Sagarika’s daughter who blames her mother on her father’s alcoholism, eventually dying an untimely and unnatural death. The audience applauded the performance and the dialogue delivery.